Making-Healthy-Choices e-Zine #012 - Want Younger Looking Skin? A fr*ee monthly newsletter to inspire you to be the healthiest, most vital and vibrant version of You! A warm welcome to the Making-Healthy-Choices e-zine... Taking the time to focus on your health is the most important thing you can do - you are worth it! Pampering yourself is such a great thing to do for your health and wellbeing. Pamper your skin and your entire being with this fun home spa treatment. Going to a spa for treatments can be wonderful but can also be very expensive .. and you aren't always sure of the quality of the ingredients they are applying to your skin. Because your skin is your body's biggest organ and because you do absorb whatever comes into contact with your skin, it is important to make sure you aren't getting skin treatments done with toxic chemicals. Last weekend we did a great little 'spa-like' treatment right in our home that was cheap, easy, fun ... and left our skin feeling nourished, hydrated, soft, silky and younger looking!!! Set aside time once a week to do this and enjoy the benefits. We first did a full body mud treatment and then followed that up with a full body herbal scrub. Mud or clay is wonderful for pulling toxins out through the skin and body scrubs are amazing to exfoliate, nourish and hydrate the skin. You can buy clay, here. We used bentonite clay which is renowned for its detoxification properties. Mix enough of the dry clay powder with warm water in a big bowl and whisk together until you have a nice clay consistency. Stand in your tub and apply the clay to your entire body, have fun with this. Get in the tub with your partner and enjoy rubbing the clay all over each other. Light candles, put on music, dim the lights and create a beautiful soothing 'spa' environment right in your own home. You can leave the clay on for as long as you like, the longer you leave it the harder it will become. When ready to rinse off, turn on your shower and rinse the clay off your entire body ... you are now ready for part two - THE FULL BODY HERBAL SCRUB. Prepare this at the same time when you are mixing your clay and bring it into the bathroom with you so it is ready for you as soon as you have rinsed the clay off. Mix together well and, if desired, you can add a few drops of your favourite essential oil. 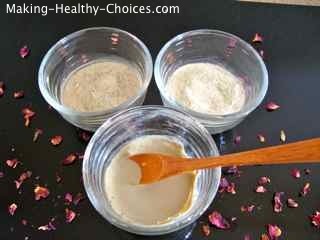 Once you have rinsed the clay off of your body, take small handfuls of your scrub mixture and rub all over your body. 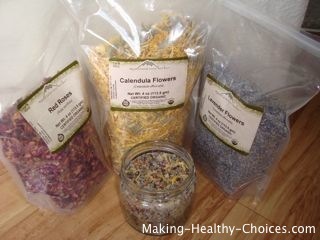 Enjoy breathing in the scent of the herbs and essential oils. A nice gentle circular motion will provide a perfect exfoliation for your skin. Rinse off and enjoy how hydrated and silky smooth your entire body now is. Sunshine is good for you!!! And of course anything, even good things, if ingested to excess, can be bad. So, with keeping in mind what is the proper intake for your body - get out there and get some sunshine on your naked skin and eyes (ie. no sunglasses/glasses, contacts, sun lotions, creams, etc). A bizarre campaign has happened in the last years where now people are actually afraid of the sun ... 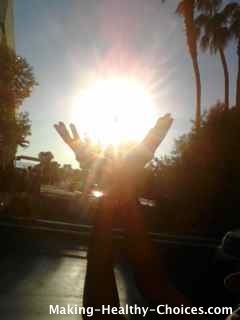 THE SUN!! .. it is what gives life to everything on the planet. We need it to exist, to be healthy and to thrive. People have become so fearful of the sun that there is now a thriving vitamin D supplement industry!!!!! Get your vitamin D from the sun, in its natural form. Instead of using toxic sunblocks, sun creams, sun lotions, etc. simply get into the shade when you have had enough sun for one outing. Or cover your body with a hat, and loose fitting, natural fiber clothing. Ensure your diet is high in foods that offer natural protection from the sun, things like tomatoes, watermelon and berries. If you must use sunblock find one that is completely non-toxic, all-natural and all organic. Almost every reusable drinking bottle I have found has been plastic. As I am trying to move further away from using plastics, I was delighted when I found these great glass bottles from Life Factory. I bought the largest size which is 22oz and I wish that they made one even bigger than that! Drinking water (or any other drink) out of these gorgeous glass bottles taste noticeably better than out of plastic. You can always just use a plain glass mason jar but the great thing about the Life Factory bottles is the protective silicone sleeve that the bottle sits in and the easy to carry handle on the lid. And they come in some really fun colors!! 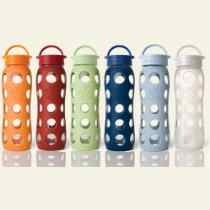 Check out these beautiful glass drinking bottles here! I recently got some blood tests done that involved several vials of blood being removed from my body. Blood contains our life force, if you are giving your blood away, either for donation or testing purposes, here is a great drink that you can bring with you to drink afterwards. 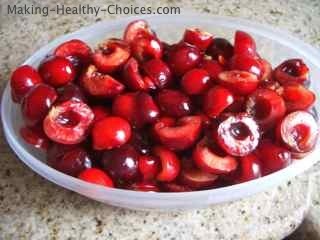 A drink that can help your body to replenish and build your blood. 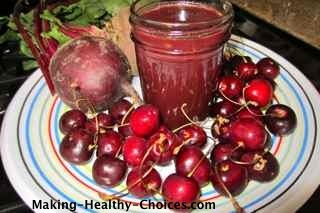 In a blender, blend together the coconut water, juiced beets, juiced green leaves and pitted cherries. Pour into a glass jar with a lid (I used my beautiful glass drinking bottle from Life Factory) and bring with you. Immediately after giving blood, enjoy your blood building juice. If you like this e-zine please share it. If it's been shared with you please subscribe to the Making-Healthy-Choices e-Zine here. Next month: More quick and easy Holistic Health Tips and Information. Disclaimer: This e-zine is for educational purposes only, for the free exchange of ideas in relation to health and wellness. There is no intention to diagnose, prescribe or be a substitute for the advice of a licensed medical practitioner. It is your birthright to learn and make your own choices and the author holds no responsibility for you doing so.